Our hearts break when we place Alia Bhatt on this list. The Kalank actress has been travelling all over the country to promote her summer release. While she has been impressing with some of her traditional outfits, she misfired with her pink ensemble. Alia was recently spotted at the airport wearing a pink maxi dress clubbed with a matching overcoat, a Chanel tote bag and sneakers. All in pink. Although the colour looked beautiful on her, it was an overdose. From head to toe, Alia looked like a walking cotton candy. And to top it all, the dress was clearly ill-fitted. Tara is following the footsteps of Alia into the industry with Student of the Year 2 and unfortunately, she’s followed Alia to our worst dressed list as well. The actress, who makes her debut on the big screen next month, was spotted at the SOTY 2 trailer launch wearing an unfortunate white tube dress. There are many problems with it. First of all, that outfit looked like two dresses have been stitched together. Secondly, the attire looked extremely tight around the bust. Third, it was not made for Tara. She looked oh-so-pretty in bright dresses in the trailer. Why kill it at the launch? Joining the class this week is Priyanka Chopra Jonas. 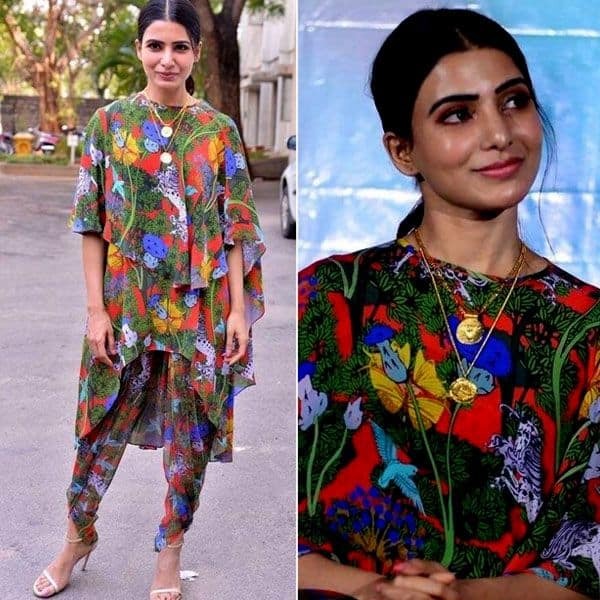 The actress made an unfortunate fashion choice when she stepped out wearing an Eloshi ensemble. Priyanka looked out of her fashionable element in the outfit. The matching skirt, which featured a slit on the sides, did not help either. While we understand that the sagging shoulder line was a part of design, but had it been placed traditionally, it would have look smarter. And maybe she could have worn a pair of black pants instead of the skirt, to give it that classy look. The gorgeous South star unfortunately features on our list this week. The stunning actress walked out wearing a colourful asymmetrical kurta and matching dhoti pants. Honestly, it looked like she has just walked out of a child’s painting. There was just too much going on for the actress, dress wise, that it stole the thunder from her pretty face. Maa, we spotted a unicorn and now we wish we could un-see it. Amyra took glamour a step down when she dressed up in unicorn colours – hues of pink and purple – and missed the mark. Although we loved the colours chosen, the way she chose to wear them is a big no-no. The actress flaunted these colours in a shimmering coat and short and we wished she hadn’t.